Are you healing from surgery or another ailment? Working hard to stay clean and sober? The way you think about your recovery is everything. 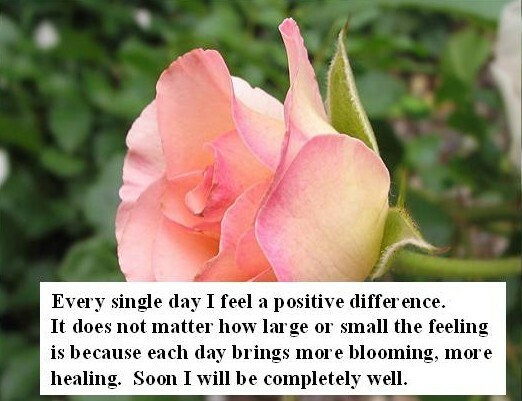 It is important to maintain a positive outlook on not just your healing process, but on your environment. To help my mom recover from a serious heart condition, I created “Positive Healing Cards” for her. Each one has a beautiful picture and a positive message. I asked that she look at them throughout the day to help her to stay upbeat and positive about her recovery. The cards that I created for her were very customized to her specific condition and mindset. They also included of her children, her grandchildren and her pets as well as the nature . I have created Positive Healing Cards to share with the readers on Women Move the Soul. The link below is a PDF file with four cards on each page. You can print them and cut them out. You can also create your own tailored to a person’s ailment. For instance, stating that the fibroids will shrink, or that the heart is functioning at 100%, or that the medicine is powerful and is working, or that I am clean, sober and strong!, etc. You get the idea! …I am certain that once these go out, some big corporation is going to start creating them and selling them for profit. Remember, that you found them here first! …and for FREE. Be well sisters, be well.